Swarovski Optik is an Austrian family-owned company steeped in the tradition of producing superlative binoculars and telescopes. Their products are often icons of both optics and asthetics. Swarovski's posh spotting scopes are hallmarks of the distinguished brand. They're available in two objective sizes, straight or angled viewing, and with regular or ultra-low dispersion glass. It is entirely a personal preference which cannot be determined except from experience, but many prefer straight scopes for the "obvious," intuitive way they'll locate a subject. The 65mm size still lets in a sizeable chunk of light but can easily be tolerated upon a long hike. The "HD" versions of Swarovski's scopes feature elements with extra-low dispersion glass. This provides an even more remarkable image, with better edge resolution. In particular, color fringing is nearly eliminated. Subjects with intricate patterns will have crisper delineation, something enthusiastic birders will greatly appreciate. 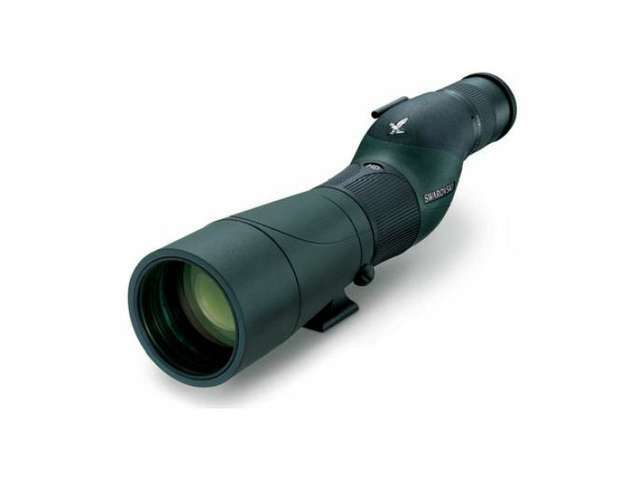 The ATS & STS series spotting scopes have a focal length of 460mm. If you're using conventional 1.25" astronomy eyepieces with the optional #6290307A Astronomy Eyepiece Adapter, divide 460mm by the focal length of your eyepiece to determine the effective magnification.